Joshua Tree National Park. For a first-time visitor the desert may appear bleak and drab. Viewed from the road, the desert only hints at its vitality. Closer examination reveals a fascinating variety of plants and animals. A rich cultural history and surreal geologic features add to the attraction of this place. Two deserts, two large ecosystems whose characteristics are determined primarily by elevation, come together at Joshua Tree National Park. Below 3,000 feet, the Colorado Desert encompasses the eastern part of the park and features natural gardens of creosote bush, ocotillo, and cholla cactus. The higher, moister, and slightly cooler Mojave Desert is the special habitat of the Joshua tree. 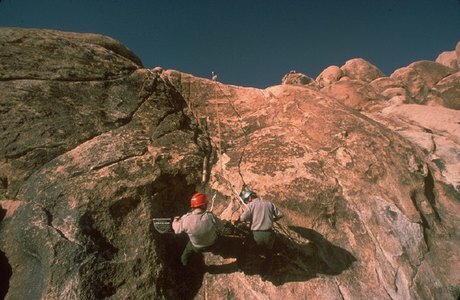 In addition to Joshua tree forests, the western part of the park also includes some of the most interesting geologic displays found in California�s deserts. Five fan palm oases also dot the park, indicating those few areas where water occurs naturally and wildlife abounds.